▼Spec. : 10.31" (Length), 8.11" (Width), 1.18" (Height); Four-layer fabric (One Carbon Layer) ; Installation instructions included. ▼Benefits: (1) Reducing at least 98% of these contaminants (Dust, Pollen, Exhaust Gas, Bacteria, Particles of 5-100 microns...etc.) from the air passing through the filter & entering the interior of the vehicle. 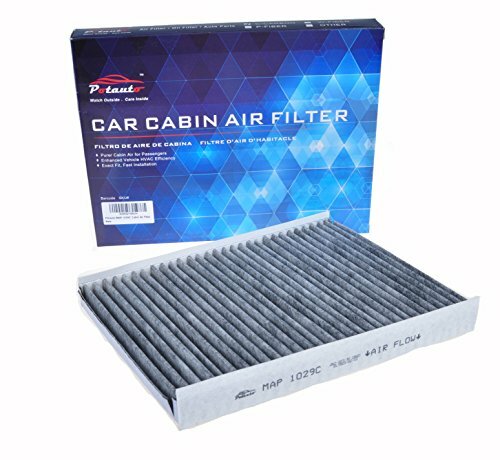 (2) Activated carbon cabin filter provide extra protection by absorbing Adsorbing the airborne infectious agents & allergens, which aggravate respiratory diseases. (3) Increase safety through reduced deposits in the fan or on the windscreen, and protect HVAC air conditioning performance. ▼***Change filter every 12 months or 12, 000-15, 000 miles. Check & replace filter if peculiar smell / odors emit from the cabin air outlets, or if the vehicle HVAC system operates with poor performance, or humming, or weak air volume. ***LEGAL DISCLAIMER: The Brand name & Model # (if listed) are for cross reference only. All Brands, Trademarks & Model Numbers remain the property of their respective owners.